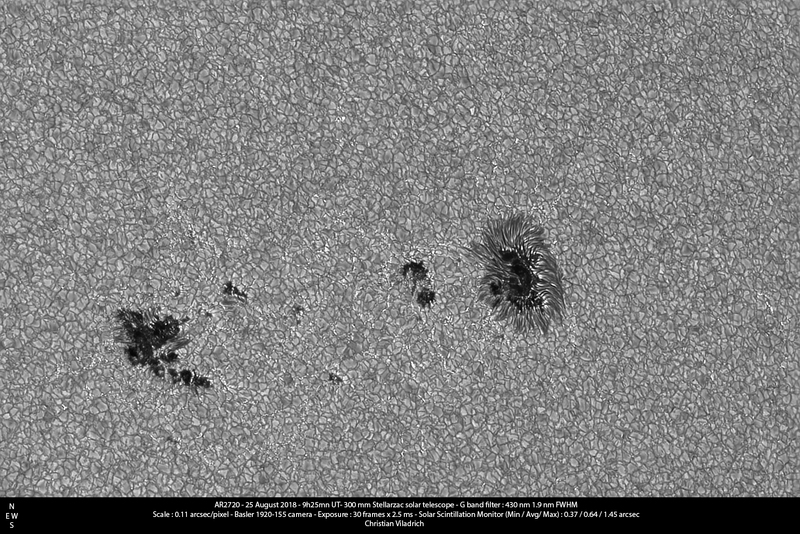 HR images of AR2720 Aug 25, C14 EdgeHD versus 300 mm solar scope challenge - SolarChat! I have still some images left on my HD taken last August at St Veran . Here is an image of AR2710 taken with my 300 mm solar scope in G band (430 nm 1.9 nm FWHM). There are many filigrees (bright spots) visible in the intergranular region. Many ombral dots are visible in the ombra of the pore at lower left. There is a kind of ring of umbral dots in the umbra of the spot at right. Some bright spot are visible along the filaments of this same spot. No comes the interesting thing. Thierry Legault was imaging at the same time with its C14 EdgeHD, 3.8 Astrosolar and OIII Astronomik filter (500 nm FWHM 12 nm). We we only 6 to 8 m apart. We happen to take an image at the same time, meaning the seeing was correlated on a 6-8 m base. - the level of diffuse light with the Astrolar is larger than with the uncoated mirror. - the granulation shows more contrast at 430 nm than to 500 nm. Still ... the Astrosolar turns the C14 into an amazing solar scope at a minimum budget. Thanks for this Christian a very good comparison. Interesting and informative comparison Christian, thanks! That is a great comparison, Christian. And it underlines my conclusions when I compared my images with the EdgeHD11 / AstroSolar3.8 with those. made with your solar newton: with the AstroSolar I do not short enough exposure times. I had tried mylar emergency blankets many years ago but image quality wasn't that great. BTW, we also tested a density 2.5 filter for another manufacturer. It was very bad. Stu : usually, the seeing conditions is the limiting factor. Here the limit was set by the instruments. Christian, maybe Baader would be willing to produce some test sheets with OD2.5 if there is sufficient interest. That's one of the reason why I mentioned my earlier contact with Thomas Baader ;-) If he would see that there is a sufficient number of people interested and also able to get hires narrowband (i.e. with 2-10nm FWHM) continuum images at e.g. G-Band, TiO, CaK with apertures of 8 inches and more, they may develop a product and could have a new product to offer when the solar minimum is over in two years or so. Last edited by LauraMS on Sat Oct 06, 2018 9:10 pm, edited 1 time in total.